100% Through Bolt Construction – Barracudas are designed and constructed like no other boat. Every component is Through Bolted and secured, with Stainless Steel Lock Nuts and Bolts. Major components, such as consoles, windshields, leaning posts, T Tops, Bimini mounts, and locker lids are 100% through bolted for superior quality and longevity. Even smaller components, such as horns, lights, clips, brackets, snap tracks, and wire harness straps are also through bolted. In fact, the only screws you will find on a Barracuda, are the 2 front speakers, and the outer rub rail screws, since these are the last 2 components to be installed. This means that fittings will not work their way loose over time. You will not find the sharp end of a screw Anywhere in the console or bilge. 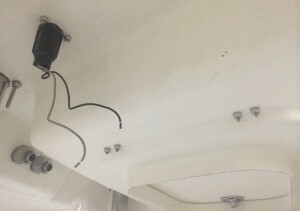 Water will not weep through screw holes blown through fiberglass. You can rest assured that every component was skillfully placed and bolted into the boat, where it will remain as tight as the first day it was assembled. 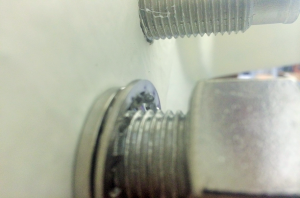 100% Indexed Fasteners – Take a close look at Every Screw and Bolt Head. They are indexed at 3 ‘O Clock and 12 ‘O Clock. This level of detail is usually only found in Multi-Million Dollar Mega-Yachts. Because those that expect the finest details, notice the finest details. This mentality is expressed in every Barracuda we build, with every fastener in the boat installed with precision. 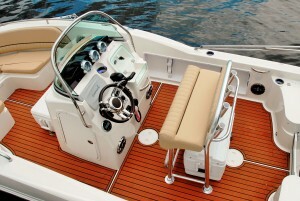 Superior Laminates for Superior Construction – Barracudas are built to a higher standard than most boats. 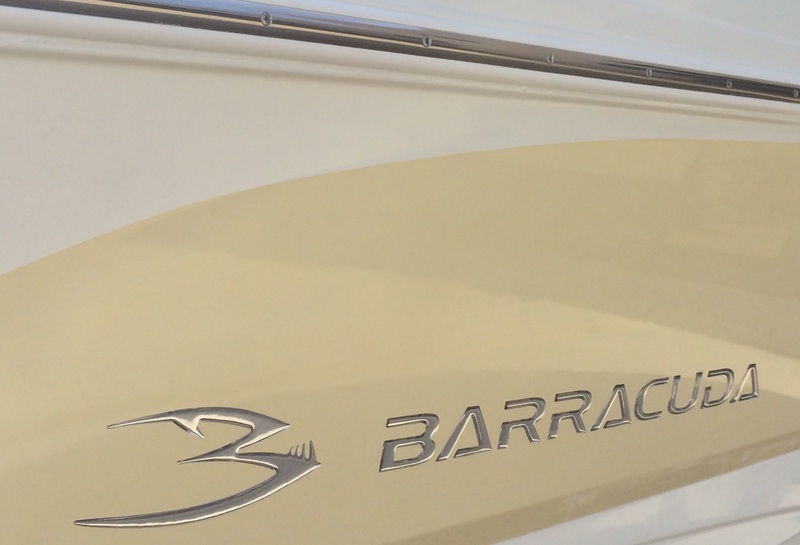 Barracuda utilizes Vinylester Resin as a barrier coat, in both the hull, AND the deck. While the industry standard dictates a barrier spray coat between the gelcoat surface and the bulk resin laminate to prevent blistering, Barracuda instead utilizes a Vinylester Resin that is completely impervious to water penetration and blistering. This means that even after you scratch through the gelcoat or barrier coat, the fiberglass resin itself is impervious to water. 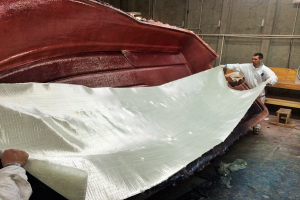 In addition, Barracuda utilizes this Vinylester Resin in both the hull AND the deck, to prevent blistering from moisture or water puddled or accumulated under the cover. This unique Laminate structure offers superior quality and protection, ensuring that your Barracuda will retain its luster and integrity after many years of use. Livewell is Bonded In-Mold to the Deck – Instead of bonding the livewell to the deck after the part has been pulled from the mold, Barracuda molds the livewell directly onto the deck while it is still in the mold. This ensures several benefits. First, the deck and the livewell are bonded together in the primary bond, offering the strongest joint possible. The livewell is truly an integral part of the deck. Second, the livewell’s physical dimensions can be increased past the opening, to increase the capacity to 30 gallons. This allows access from the livewell to the through bolts, cleats, rod holders, and fittings in the deck for 100% serviceability. Lastly, the livewell is 100% Sealed and Fiberglassed to the deck, so no baitfish or water will sneak into the bilge. This prevents that fishy odor from contaminating the bilge of the boat. Service Access – Avid Boaters certainly know the pitfalls of servicing or accessing components on traditionally designed boats. 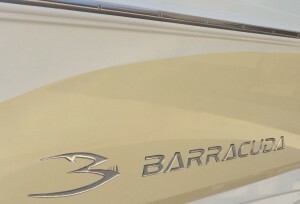 Barracudas are unique, as everything on the boat is designed with service access in mind. The rig tube is perfectly straight, with no corners or bends, to ensure easy additions of electronics or transducers. All deck hardware through bolts are easily reached from designated service points. The bow speakers are perfectly centered between the rail bolts, cleat bolts, and canvas eyes.